Despite the credit crunch and worldwide recession of 2008, long-neglected Folkestone is starting slowly to reclaim its Edwardian-era reputation as ‘the jewel of the Kent coast’ with a substantial – and very creative – regeneration project. 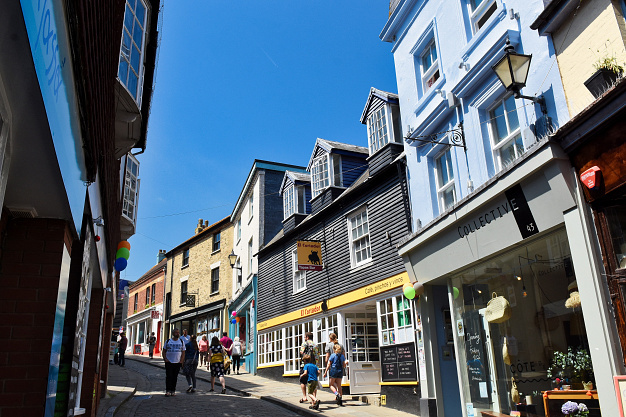 After 15 years of hard slog, Folkestone’s Creative Quarter, the brainchild of local businessman (and former Saga Group owner) Sir Roger de Haan, is finally becoming self-sustaining and an outstanding example of how – with foresight, investment and imagination - Britain’s fading coastal towns can be restored to prosperity. Read our Best Practice guide to learn how this ‘jewel of the Kent coast’ succeeded in reversing its economic fortunes! I agree to receive the National Coastal Tourism Academy newsletter. We are committed to protecting and respecting your privacy, read our policy here. By accessing this article you are agreeing that your download activity will be recorded by the National Coastal Tourism Academy.